It’s official: Wendy Davis, a 16-year Bremerton police officer, is headed north to take the reins of Poulsbo Police’s deputy chief position. Davis, 44, has been a sergeant in Bremerton nine years and is currently the head of the police officer’s union. She’ll fill a position that’s been vacant since the beginning of this year, after Shawn Delaney took a voluntary separation agreement during city cost-cutting. Poulsbo Police Chief Dennis Swiney said Davis will have a lot of projects in the new role, most notably running the day to day operations of the department, which consists of 16 commissioned officers. The months-long hiring process was competitive, he added; about 40 cops applied. Davis will conclude her time in Bremerton later this month. She starts in Poulsbo Nov. 2. She’ll be sworn in the same night at the Poulsbo city council meeting, Swiney said. Davis, who graduated from high school in Brookings, Ore., went into the Marine Corps and was stationed at Camp Pendleton in California. Her first husband, Ron Davis, was also in the corps and then into law enforcement. He was ultimately killed in the line of duty, responding to a domestic violence call. 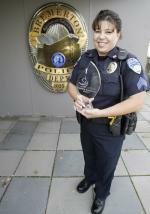 She herself got into law enforcement after moving to Kitsap County, become a Bremerton reserve officer in 1992. She was hired full time in 1995. At the department, she met her husband-to-be, Mark Thompson, who is still a sergeant there. This year, Davis has been in the spotlight as head of the police officer’s union during the surfacing of controversial incidents involving police officers with an explorer. She also serves on the Kitsap County Fair board. As the photo indicates, she’s won a Healthy Tomorrow award for her involvement in the community. There’ll be a lot to learn in her new job but she said she’s ready for it.